I loved every page of this book, but it’s a bit tricky to know where to begin with a review. Why, you ask? In the bookstore I was instantly drawn to the bright coloured cover of this book, so picked it up to see what it was about. I read the back cover…. and found out very little, other than there is a young girl called Melanie who is confined to a cell and only bought out when strapped into a wheelchair and surrounded by armed guards. Intriguing, and more than enough for me to decide I wanted to read the book and find out more. Maybe it’s good to go into this book blind, without knowing what lies in store. I did happen to see a review before I began the book which mentioned the main theme, and I didn’t find it detracted at all from the read, as it’s a point which becomes clear quite early on anyway. Just in case you don’t already know, and don’t want to be spoiled, I can end here by saying I really doubt you’ll regret giving this book a chance, I thought it was an amazing read; a great story and well worth your reading time. While I’m a big fan of The Walking Dead TV series I don’t think I’ve read a novel featuring zombies before, so this was a first, and I doubt it will be a last. I’ve already received some recommendations and will be checking some of them out soon. 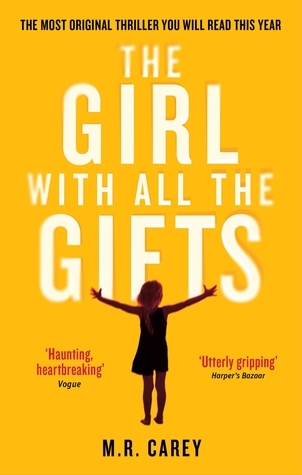 In The Girl With All The Gifts I loved the focus of the story – a group of survivors of the Breakdown come under fire and their supposedly safe base of operations is laid to waste, forcing them out into a world overrun with zombies, known as hungries. The scene setting and character development in the early stages happens at a leisurely pace, and I found myself drawn in to the strange world where children such as Melanie are treated with caution and fear, yet are made to observe daily routines such as school lessons. The Girl With All The Gifts is very much a character driven novel as we journey alongside the survivors, thrown together by circumstance. The group includes Dr. Caldwell, Sergeant Parks, Private Gallagher, Miss Justineau, and Melanie. All these characters are well developed and it’s easy to become drawn in to their hopes, agendas and motivations. A nice twist is that Melanie is a young girl who is also a hungry, but she appears to have some natural immunity to the fungus which effectively wiped out humanity. She is still very human, in thought, action and emotion, and she’s so endearing, with her love of learning and her politeness towards the people who restrain and fear her. I found I couldn’t read quickly enough because I just wanted to know that in the end everything was going to be alright for Melanie and her teacher Miss Justineau, who is Melanie’s main ally throughout the book. 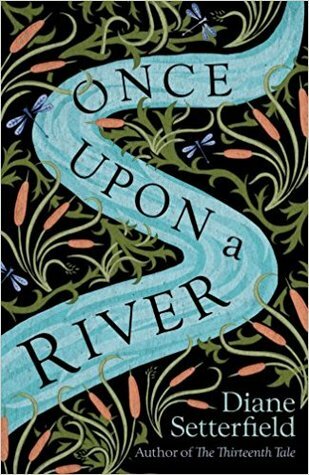 Miss Justineau’s humanity in an inhuman situation, and her refusal to accept that the children in her care are simply specimens, makes you warm to her very quickly, and her friendship with Melanie – of whom she is very protective – is central to the story. Melanie’s self awareness as the novel progresses is great; she acknowledges that without restraint she may not be able to control the urges that disgust her, yet compel her to hunger for flesh. These same traits make her a formidable match for the evils of the outside world, and this makes for compelling reading, especially when she comes to the defence of the people who were once her captors. In contrast to this is Dr. Caldwell, the rational, driven scientist searching for a cure, who sees Melanie as little other than test subject one, a specimen to aid her search. Her early actions reveal that the ‘monster’ isn’t always necessarily the most obvious candidate, and some of her behaviour is pretty brutal as she relentlessly aims to end the plague. There’s a particular scene between Melanie and Dr. Caldwell in Caldwell’s lab which really had me on the edge of my seat whilst at the same time being really sad. The book has action, horror, and thriller elements as our group encounters various trials, from the never-ending masses of hungries, to Junkers (people who live taking their chances in the wild), and a wonderfully brutal group of young hungries with the same natural immunity and human traits that Melanie has, only less refined as they have not had the benefit of being around other people, or having the sympathy and compassion of someone like Miss Justineau. I loved the pacing of the final stages of the book, and the way Melanie came to the forefront (I am finding it REALLY difficult not to go totally overboard with the spoilers here). The book ended in such a way that I wished I knew someone else who had read it at the same time as me, so we could talk about it. It wasn’t what I was expecting, but it was a fitting close to a wonderful book. I borrowed The Girl With All The Gifts from the library, and noticed that there was a request list for it, for a reading group at another branch, and I think it’s a perfect choice for reading in a group, because there are SO many talking points that I’m sure they’ll fill their time easily. Ok I stopped reading at spoilers-just commenting to say the wait for this at the library is killing me! Glad you loved it! I just peeked at your review as well because I have this one on my TBR list. I have seen so many good reviews for it that I cannot wait to read it myself!!! !